This interesting surname is a variant of Halewood, which is of Anglo-Saxon origin, and is either locational from a place so called in Lancashire, or topographical for someone who lived by "a hollow in the wood". The placename is derived from the Old English pre 7th Century "hale, h(e)alh", nook, hollow, recess and the Middle English (1200 - 1500) "wode", wood, from the Old English "wudu". The placename was first recorded as "Halewode" in the Cockersand Chartulary circa 1200. The name development since 1552 (see below) includes: John Halewood (1558, Lancashire), Martin Hawled (1587, Westmorland), Richard Hallede (1631, London) and Samuel Hallad (1777, Lancashire). 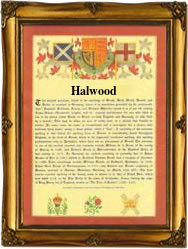 The modern surname can be found as Halewood, Hal(l)wood, Hallede, Halhead and Hallad. Among the sample recordings in Lancashire are the marriage of Agnes Halhead and George Rigge on October 6th 1668 at Cartnel Priory Church, and the christening of John, son of Robert Halhead, on December 19th 1713, also at Cartmel Priory Church. The first recorded spelling of the family name is shown to be that of Margaret Hallad, (christening), which was dated May 23rd 1552, at Middleton by Oldham, Lancashire, during the reign of King Edward V1, known as "The Boy King", 1547 - 1553. Surnames became necessary when governments introduced personal taxation. In England this was known as Poll Tax. Throughout the centuries, surnames in every country have continued to "develop" often leading to astonishing variants of the original spelling.